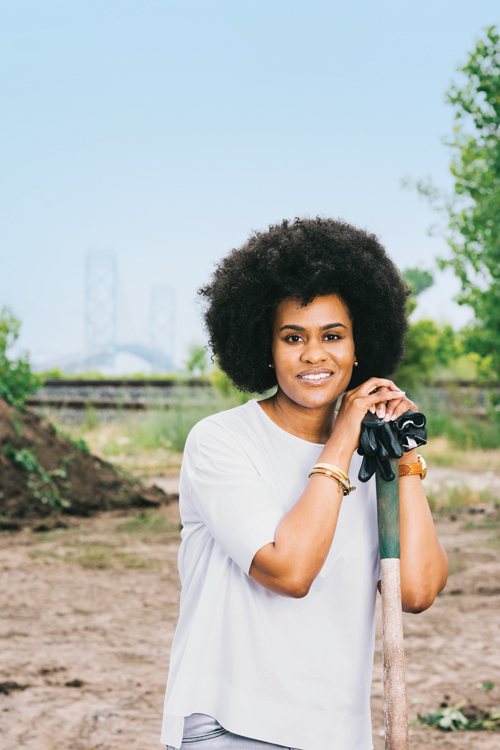 W hen Pashon Murray moved to Detroit from Grand Rapids a few years ago to launch a recycling company, she encountered a challenge: She couldn’t find vacant, uncontaminated land to build on in the city. Murray wasn’t the only one facing polluted land issues. 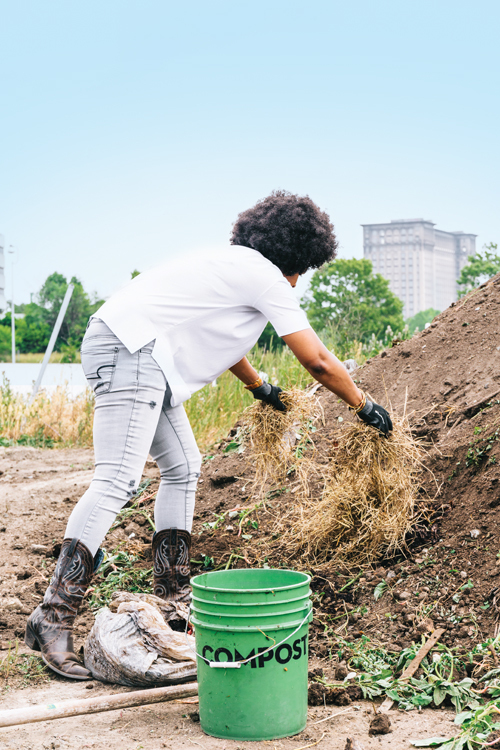 Finding healthy soil is also a problem for Detroit’s urban farmers. So Murray, armed with a drive for waste reduction and an eye on Detroit’s growing urban farming industry, co-founded a collection company that would provide organic compost and biomass solutions for metro Detroit. She dubbed it Detroit Dirt, which launched in 2010. 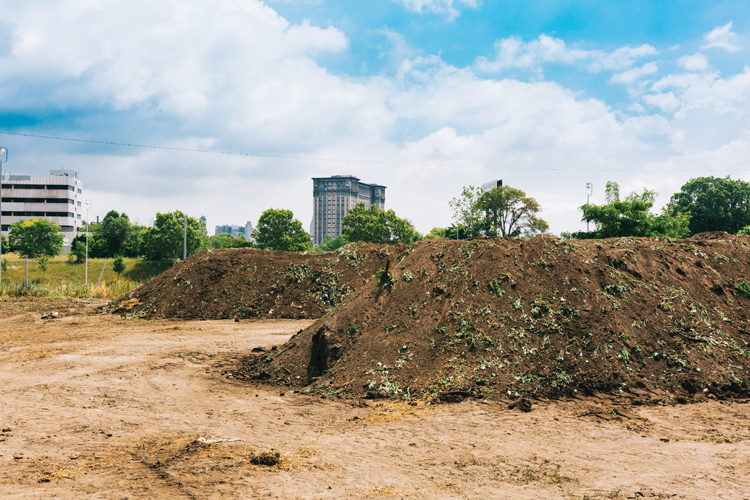 The first course of action was to dig up land at a 2-acre site located in southwest Detroit, which was re-soiled with Murray’s prototype compost, a mix of vegetable scraps, leaves, herbivore manure, and rich soil. Ensuring soil health has relevance in an urban landscape like Detroit, especially for the city’s growing number of urban farmers and community gardeners seeking to produce food. Keep Growing Detroit, an organization that provides resources for local gardens and urban farms, and The Greening of Detroit completed over 900 soil tests in its analysis of samples from 2004-13, 16 percent of which came back with unsafe levels of lead. The test also showed that most samples with high lead levels were closer to the riverfront than outlying neighborhoods. As of 2016, 18 percent of the results returned above KGD’s recommended action level. Murray’s successful composting process attracted the attention of not only urban farmers, but also corporate partners, including The Detroit Zoological Society and General Motors. 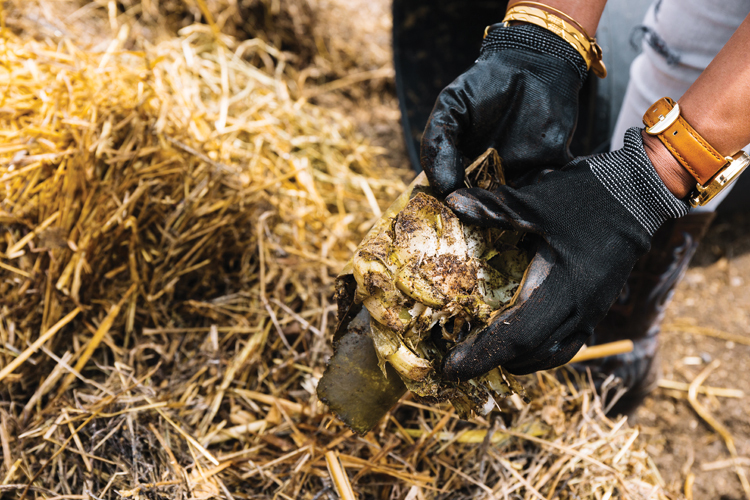 A pilot aimed to test Murray’s closed-loop model system of collecting scraps, composting them, providing the compost to local farms, then collecting and repeating the process. The company began collecting scraps from restaurants, coffee shops, breweries, and other businesses around metro Detroit, but it also added a key ingredient to its compost: animal feces from the Detroit Zoo. Zoo animals produce, on average, 400 tons of manure annually and by using only herbivore manure and vegetable scraps, Murray was able to create compost at the southwest Detroit site. 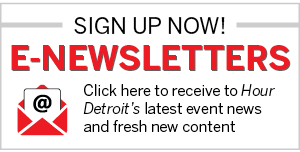 The yearlong pilot program was profitable, and today Detroit Dirt continues to collect food scraps from about 15 businesses, including restaurants at the Renaissance Center and Blue Cross headquarters, as well as smaller clients such as Astro Coffee. Deveri Gifford, co-owner of Brooklyn Street Local in Corktown, collaborated with Detroit Dirt during the first two years after her restaurant opened. “They were our compost processor for all of our food scraps at the restaurant,” Gifford says, adding that while Detroit Dirt’s compost contributes to individual businesses, compost in general can help create a better understanding of where a community’s food comes from. Dan Scarsella, co-owner of Motor City Brewing Works, says a past partnership with Murray allowed MCBW to create community awareness of recycling as well as repurpose their used barley scraps. Although the brew master no longer uses Detroit Dirt, Scarsella says several pounds of grain a year are now sent to be composted through a similar program at Palmer Park in Detroit. Murray collaborated with General Motors in a 2012 pilot program. And in 2014, they teamed up to create a rooftop garden on the top of the Renaissance Center’s Beaubien parking garage. Today, the rooftop garden makes use of coffee grounds and vegetable scraps from Andiamo Riverfront and 20 other restaurants, as well as a flower shop. As a result, 36,000 pounds of food are now turned into rich compost in six months. Additionally, the urban garden’s steel shipping crates, which were collected from GM’s Orion Assembly Plant and repurposed as raised garden beds, now yield nearly 190 pounds of vegetables. The vegetables are served throughout the RenCen. The process has helped GM establish a “landfill-free” status. Murray’s efforts have earned her significant recognition. She received the Martha Stewart American Made craftsmanship award in 2014. And Newsweek magazine named Murray one of its “13 Women in Business to Bet On” in 2014. Additionally, as a fellow at the MIT Media Lab in Cambridge, Mass., she has launched programs on research and sustainability. Murray has also been traveling nonstop to bring awareness about composting and food waste. Closer to home, Murray is collaborating with the city and mayor of Highland Park to bring her closed-loop model to that area. “We are still looking at land,” she says. She’s also working with Shinola to establish a line of garden productsâ€…—â€…tools, gear, books, and compostâ€…—â€…that will be in Shinola stores as early as spring 2017. Part of that work involves talking to students, and Murray believes that if she educates others about food waste at a young age, they will carry it throughout their lives. “We as people need to be a little bit more responsible on how we budget food, buying what we need instead of what we think we want,” Murray says. “Just because a resource is plentiful today, doesn’t mean it will continue to be.